What did NZ soldier's have for Christmas? 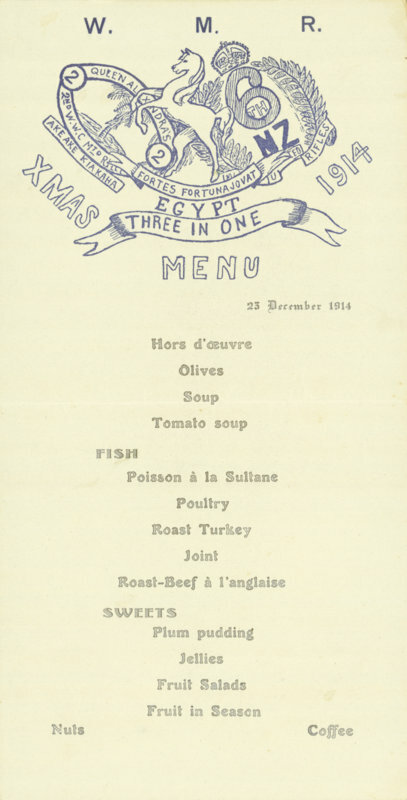 These Christmas menus are in the archive of Arthur Batchelar. Click here to see more from this collection. Apart from special meals, which varied according to where the soldier's were stationed, friends and family at home sent gifts and treats for the men overseas. According to the newspaper reports, the Christmas mail for soldiers on the frontlines was over 2.5 million letters and half a million parcels. In addition to sending gifts and well-wishes, churches and religious groups around the country said The Soldier's Prayer on Christmas morning. It read, "Heavenly Father, bless our soldiers and sailors this Christmas Day, and hearten them for that good fight which alone can bring true peace."